The works at the New Champlain Bridge are expected to finish by December 2018. Open since 1962, the Champlain Bridge in Montreal is one of the city’s main road links and Canada’s busiest bridge, with an average of 136,000 crossings per day. Due to the extreme climate conditions in Montreal, as well as the use of road salt on the pavement, the bridge is suffering a progressive deterioration that different maintenance and repair plans have not been able to stop. Thus, the Canadian Government decided to build another bridge as a replacement. 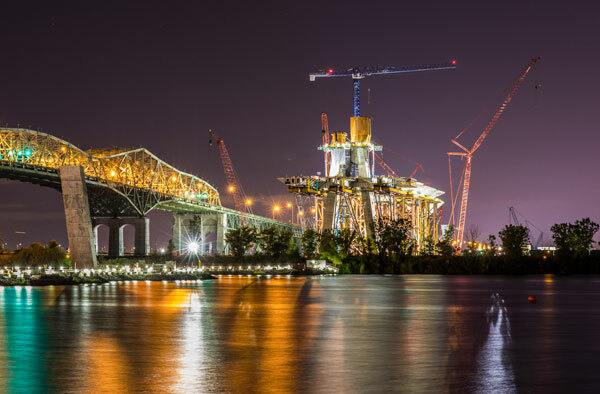 Since 2015, the Signature on the Saint Lawrence Group, formed by SNC-Lavalin, ACS and HOCHTIEF, is working on the construction of the New Champlain Bridge, located in parallel and a few metres away from the current bridge, which is still open to traffic. The new bridge will feature a spectacular 170-metre tall main pylon (558 ft), which is being built with the support of a Linden Comansa 21LC550 crane. The new road infrastructure is being constructed a few metres away from the damaged Champlain bridge, the busiest in Canada. The crane arrived to the jobsite in early September 2017 and was erected on the deck of the bridge with a height under hook of 67.8 metres. When the work of the crane ends, the crane will be 180 metre tall (591 ft) from the base of the pylon, 123 metres (403 ft) from the deck of the bridge. Montreal’s 21LC550 has maximum load capacity of 25 tonnes (55,120 lb), to lift large precast concrete structures and heavy formwork panel. Another version of this crane is available with maximum load of 20 tonnes (44,090 lb).